Desk book boxes, or as they are often called in Australia, ‘underdesks’, were small compartments under your school desk where you could store your books, pencil cases, and other stuff you needed to use on a daily basis. I’m not sure if they were common in all schools, but it was such a genius piece of storage for each student that I wished I had one at home. I’m too old for one now, but I remember being very neat and tidy with my underdesk, and I would make sure I never put any rubbish or anything I didn’t need in there. Some students were notorious for having messy underdesks, and when it came to end of school term and we were asked to clean under our desk, you would see a giant mess of crumpled up paper and pencil shavings on the floor around some people’s desks. Luckily I found a few photos with some primary/elementary school classrooms, showing that this kind of compartment under the desk is pretty common. Do you remember desk book boxes? Maybe you recall the older style where the top of the desk opened like a flap? How were your books and other things organised when you were in primary or elementary school? If you’d like to join Timeless Thoughts, you can add your link below! I’ve never seen these before, but they’re so cool. At my school we just had tables, not desks, so we had no storage space at all. In primary school we all had a drawer in these plastic chests of drawers, but other than that, nothing. And in high school we didn’t even get a locker. Clearly I went to the wrong schools! I’d love to have one of these at home. It’d be so tidy! Wow, Georgie, this post is definitely taking me back! I know we had these when I was in primary school, but once I hit secondary school, they weren’t as common. And since we were going to different classes every period, these weren’t really necessary! We just called them our desk too Tara. I’ve never heard of them referred to as Desk book boxes, to me a book box is more of a magazine box rather than the under desk storage. I can’t really remember what I put in mine.. it was probably messy though :D and probably included old food! My great aunt had one of those cool ones that flipped up I always loved that desk. I remember these well. Mine was a tad bit messy (I let book get its cover crumpled) but there were plenty of others whose desks were worse off. I never used any of the ones where the top opened like a flap but I think my dad and his generation might have come across these. Underdesks! My high school’s table was like this too! and yet students weren’t allowed to leave the books behind. ridiculous, right..what’s the use of desk boxes if students were still told to bring EVERYTHING everyday? there were no lockers too because my school was crappy like that. the teachers made a stupid excuse of, “if you leave your books under the desks, you’re gonna forget about them especially if you have to use them for studying at home, etc” and we’re like wth man -__- those textbooks were huge and heavy and students had to carry them every single day. that explains why i’m short now, pfft. to me, that was such a ridiculous excuse; if the student forgot his/her book then it’s his/her fault for being irresponsible and not double checking. I never understood the practicality of those old flap desks. How could you open them when you were working on them? I actually liked the under-desk storage better. We didn’t use a lot of textbooks in my elementary school (lots of worksheets!) so all you had to store under your desk was 1-2 textbooks, a notebook, and a pencil case. 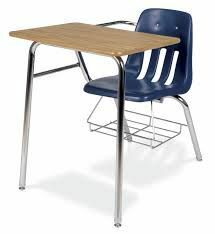 It gave you more room for your legs than the ones with desk boxes.